Looking for an upbeat workout to incinerate calories and push you to your fitness limits? Try this combination of intense kickboxing moves all perfectly choreographed to high energy and motivating music. It’s the ultimate cardiovascular challenge. I began teaching Group Fitness in 1995. Back then, I was working on my Master's degree and found that I was in the gym all the time - why not get paid? I love TAKING group fitness classes and wanted to give back by hopefully making exercise an enjoyable and challenging experience for my students. I get such an endorphin rush from both taking and teaching classes and I hope the students come away with the same endorphin rush. I definitely feed off the energy of the students, and hope I reflect back that energy for the students. Wherever I move, the gym is always the first place where I feel most at home. It's a place not only to deal with stress, anxiety, and even the isolation of being in a new place, but also a great way to meet people and create a community for yourself. I’m very excited to again be teaching on a college campus! Just prior to moving to CA, I taught for the Duke Group Fitness program while working on my PhD. I like the idea that I'm helping students build the healthy habit of a lifetime of fitness and that over the years to come, they benefit as much as I have from being a devotee of group fitness. 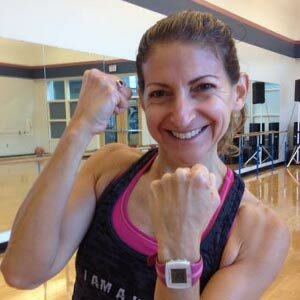 What I teach: I specialize in cardio kickboxing, High Intensity Interval Training (HIIT), boot camp, body weight and strength training, and circuit training. All of my classes use original choreography. I appreciate the wide variety of classes offered at the ARC. My interests and hobbies: As a marine biologist, of course I love the beach, the sun, salt air, and sand between my toes, and being on the water in a boat. My husband and I have renovated two historic homes. Despite the hard work and many challenges, it's very rewarding when you finally achieve the finished product. The older I get, the more I enjoy hanging out with friends at someone's house for game night or watching some good shows - probably sounds boring to most people, but I really enjoy it!